Dual listed stock – called Linde – senior management from both sides, etc. We have written extensively about the industrial gas industry, both before and after the PX/Linde idea. 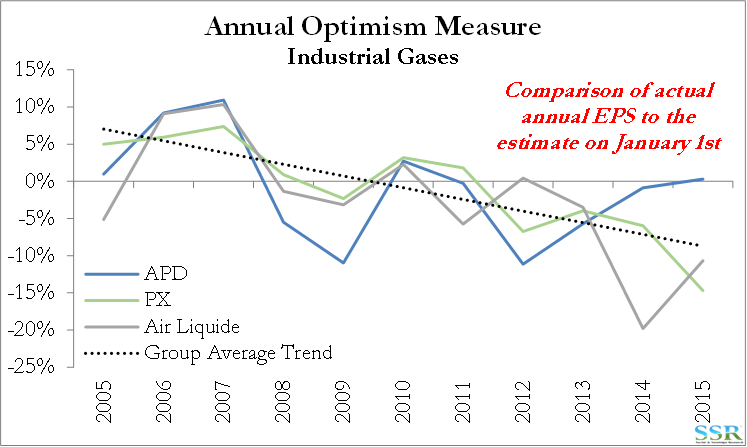 Our broad concern for the industry has been an overall slowing of growth as industrial production globally is not growing fast enough to offset the efficiency gains of customers, a lack of end-use innovation from both the gas companies and their customers, and limits the ability of the gas companies to deploy capital profitably at a rate that keeps EPS growth at the levels seen in the 2000s. APD was the clear exception as the company was the laggard in the space in terms of strategy and efficiency and over the last three years we have seen the company both promise and then deliver significant change – driving earnings growth but in an overall investment environment that is no different than for the rest of the companies. 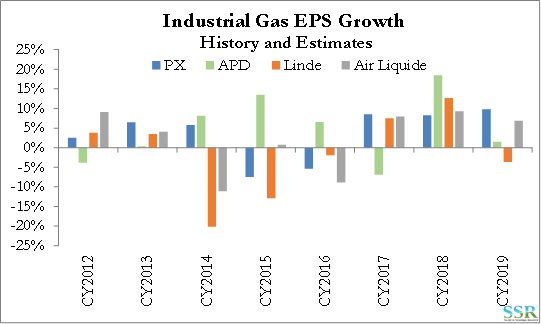 Growth stagnation has resulted in slower earnings growth – disappointments versus expectations and multiple contraction – with the exception of APD, the sector has performed very poorly over the last three to four years. 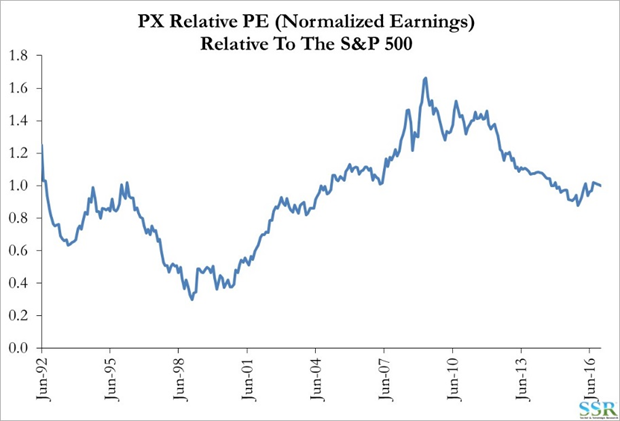 In Exhibit 2 we show earnings versus estimates for each of the last 10 years for PX, APD and AL. Data for Linde is unreliable and skewed by the acquisitions. This is the measure behind our work on optimism, where we define optimists as those who are consistent underperformers versus start of the year projections. Two things jump out of this chart – first the overall downward trend – the industry is disappointing the participants – this is driving the M&A activity. 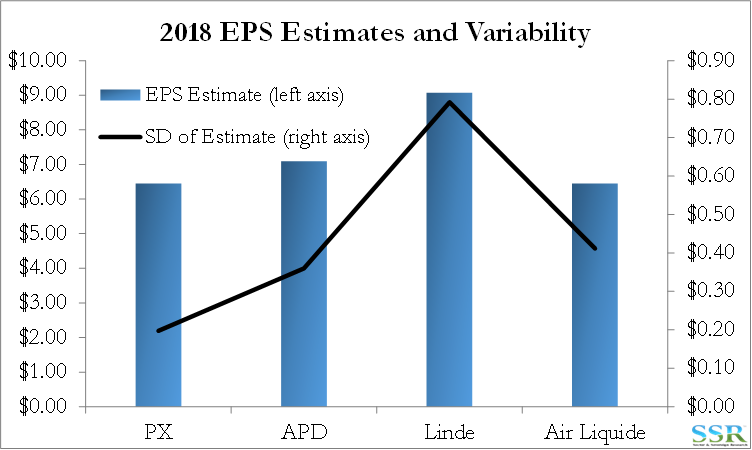 Second – the turn-around at APD from worst in the group to the better more recent data – note that APD has forecast some fairy impressive EPS growth for the last couple of years and has delivered. 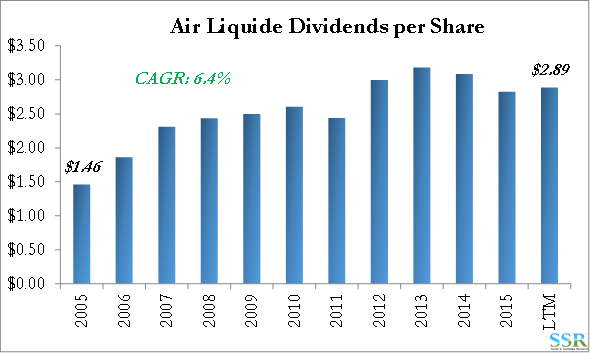 Air Liquide responded by buying Airgas, giving the company a growth platform in the US – with hindsight and the benefit of knowing the direction a Trump administration might take US investment; Air Liquide now probably thinks they may have got a bargain! This is likely a “better than the alternative” move from PX. The underutilized, merchant and packaged gas capacity in the US has generally been seen as a positive as it suggested great incremental operating leverage on what was hinted to be as much as $1bn of potential incremental sales, before stretching capacity. The Air Liquide/Airgas move now puts this aspiration of growth and leverage further out of reach in our view as PX sells to Airgas, and Air Liquide will look to capture as much of that business as makes economic sense – including adding new air separation capacity. 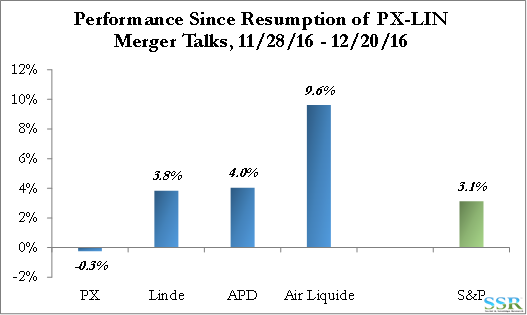 Both PX and APD are likely to lose merchant volumes in the US to Air Liquide over the next few years. We had thought there was the potential for PX to walk back from this deal after the Trump victory, as any capital spending boost in the US – especially around infrastructure – should have a fairly positive impact on packaged gas demand and possibly merchant gas demand. If PX management does expect a better US manufacturing environment under the new administration it clearly is not enough to dissuade them from the possible deal, even though they will be giving half of any real US gain to Linde shareholders as a consequence. We can see how this deal might make sense for the longer-term. PX has by far the most focused and successful approach to the Industrial Gas industry, generating returns well above the competition and driving efficiencies that none of the others have yet managed to replicate. 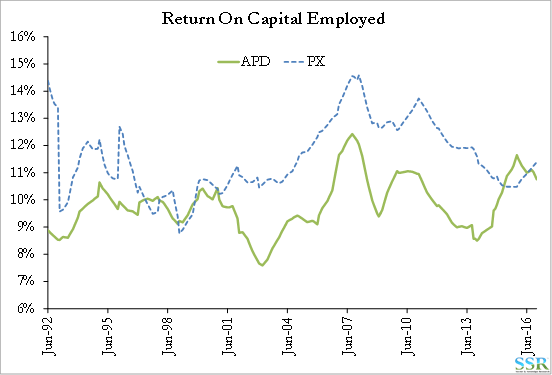 While APD has had a very impressive recovery since management has changed, when adjusted for business mix, its returns still lag those of PX significantly. Packaged gas is a drag on returns on capital because of the significant hardware involved relative to the gas sold – in Exhibit 5 it should be noted that APD’s returns should never have been lower than PX. Note also in Exhibit 5 that the recent decline for APD is driven by the Versum divestment – Versum has a much higher ROC than APD and its divestment has been dilutive to APD. Further, we are using forward consensus numbers in the model and we are unconvinced that they yet full reflect the Versum spin and the materials sale. In the merger release the companies talk about Linde’s leading technology as an opportunity. Our view has been for many years that part of PX’s success has been because it has treated the air separation as a commodity – focusing on building cheap standardized models. It is unclear to us what the value of Linde’s technology is and we would be concerned that a large engineering platform might encourage “over-design” and “over-engineering” – raising rather than reducing construction costs. Linde has very poor returns in this side of its business. The more work we do on the industry, the more we are drawn to the conclusion that Air Liquide is the only logical investment in the space today. Both PX and APD have growth challenges that are not reflected in relative multiple and while the slower growth for PX has been evident for years, we believe it is just around the corner for APD. By contrast, Air Liquide has acquired a growth engine in the US – not just with the opportunity to build on the successful growth strategy of Airgas but also with the opportunity to back-integrate behind the Airgas business, either by acquiring attractively priced assets in the US or by building new air separation capacity in locations where the Airgas demand is high. The company is as likely to see other growth opportunities slow as everyone else, and outside the US will likely slow capex, resulting is significant free cash flow. The company has been a fairly consistent dividend grower and we see ample free cash to continue this strategy. There is also capacity for share buyback and debt repayment. 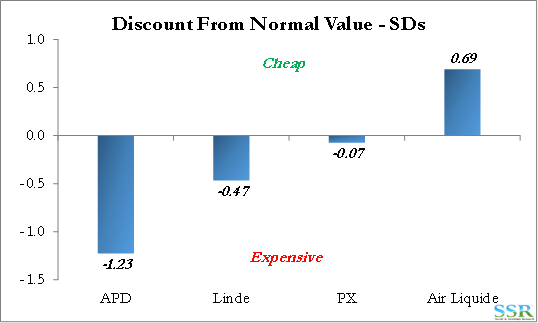 The stock has recovered since the PX/Linde discussions restarted, but the stock still looks very cheap to us in absolute and relative terms. 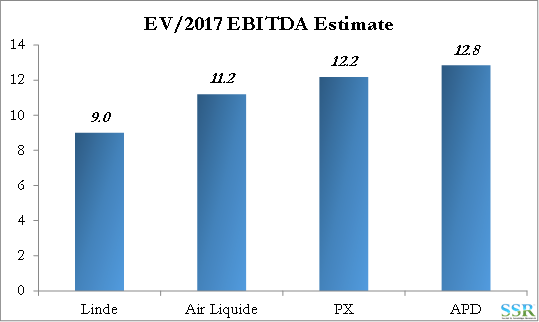 Air Liquide looks less expensive than the rest on most valuation metrics – it looks more so if you assume that the Airgas platform can give the company revenue and synergy growth above and beyond the rest of the group for the next several years. This is a very difficult topic to tackle as there is not much data – i.e. stocks which trade almost evenly on two exchanges and where there are direct comps. The Unilever example in Exhibit 10 might suggest that a dual listing is holding Unilever back, but the comps are not exact. We also show a cruise line example, which just about supports a discount – Exhibit 11 – and a packaging and paper example that does not – Exhibit 12. In short, while we cannot state with certainty that a dual listing will help valuation for PX or Linde holders, it is not obvious that it is going to help and we would also expect to see some exchange rate arb driven volatility that you do not see today. Expected divestitures to keep the regulators happy – likely reducing the overall revenue and cost pie from which costs can be cut. An engineering group which is a sizeable piece of Linde and will be at least 7-8% of overall revenues, more if forced divestments are large. The likely reality is, in our view, that PX’s management is so good on the cost and operational side, that the cost targets might be achievable, just not quickly. 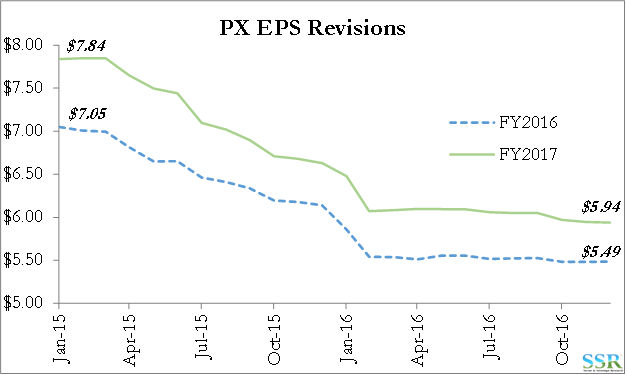 We can see this being a good deal and a good growth story for PX, looking through a 10 year lens – PX takes longer than expected to deliver the synergies, but has these as a driver of incremental EPS growth for years. PX becomes even more competitive in the plant construction business and continues to gain share – particularly over APD – with new profitable projects globally – driving a relatively better top line. However, we think it will be years before we really see any of this and in the meantime the reality of a slow growth global market continues to drive disappointing earnings and possible multiple contraction. In Exhibit 13 we show the lack of clarity on Linde’s earnings, as shown by the variability of estimates versus the other three companies. If the analysts have trouble modeling Linde, there is probably lots of raw material for PX to work with in terms of making the business more efficient.